Click the headline to read an article featured in the "Welcome to Tarboro" magazine. 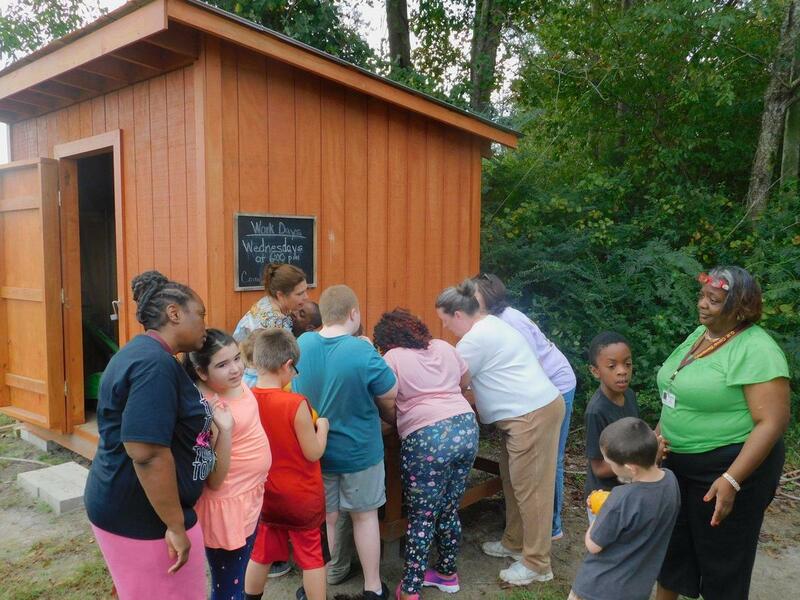 Our students from Carver, South Edgecombe, SouthWest, and Edgecombe Early College enjoy being a part of the community garden! Located on Highway 43 behind the Pinetops Clinic lies a half acre of field that grows fresh vegetables for members of the community. This plot of land is the Pinetops Community Garden and was started by Ann and Carl Warren. Ann and Carl opened the Pinetops Community Garden in March of 2017 with the help of their church, Pinetops Presbyterian Church. The garden is the product of a donation left in memory of Ann’s parents, Ann and Vines Cobb. With the help of their (Sylvia Cobb, Charlie Cobb, Bruce Daniel, and Oscar Maybery), Ann and Carl plan to grow produce that the entire community can benefit from spring through fall. So far, they have seen great results. The Pinetops Community Garden has been able to donate about 1200-1300 pounds of produce. “We had a good crop of tomatoes this year, along with okra and sweet corn,” said Carl. Several more members of the community have been a big part of their success. Specifically, Richard Joyner with the Conetoe Family Life Center, Marshall Dunn for donating the land, and the volunteers who come out to help pick the vegetables. Those who volunteer are welcome to take home a bag of fresh produce for their hard work. Whatever is left goes to patients at the Vidant Pinetops Clinic who are in need of fresh vegetables. “We’re told it’s a very popular program at the Clinic, and it really makes it worthwhile for us,” said Ann. The Pinetops Community Garden also does a lot to educate children about food and wellness. Last summer, they hosted a summer camp for children at Carver Elementary School. Each year they have had kids from Carver, South Edgecombe Middle School, and SouthWest Edgecombe High School come out to help. Many students from the agriculture class at SouthWest and Edgecombe Early College High School come out to volunteer throughout the year. They estimate that they have had over 200 students volunteer in the past two years. Students further left their mark on the garden when Carver students designed their row markers and Dakota Jones, a South Edgecombe student, designed their sign. “It is important for children to understand where their food comes from,” said Ann. The team at Pinetops Community Garden is excited to start planting again in March. They will plant many of the same vegetables they planted this year. This will include potatoes, onions, turnips, and kale in the spring; squash, zucchini, cucumbers, okra, peppers, and tomatoes in the summer; and watermelons and pumpkins closer to the fall. In the spring, Jeremiah Clayborn will also help install a new irrigation system as part of his Eagle Scout project. He is currently raising money for this project. Ann and Carl would love to see more volunteers come out to help plant next spring.